Long ago, when my kids were still in grade school and I rose early every weekday to make their lunches, cheese bread was The King. It was the kind of bread that didn’t need much more than a smear of butter. The sandwich filling didn’t really count. What counted was the bread itself and mine had big, hulking chunks of old, sharp cheddar cheese. It was the kind of bread that would grease up my kids’ hands as they anxiously clutched their gourmet sandwiches in a crowded lunchroom full of underage and drooling cheese bread-eating-wannabes. It took me a while to get cheese bread down. 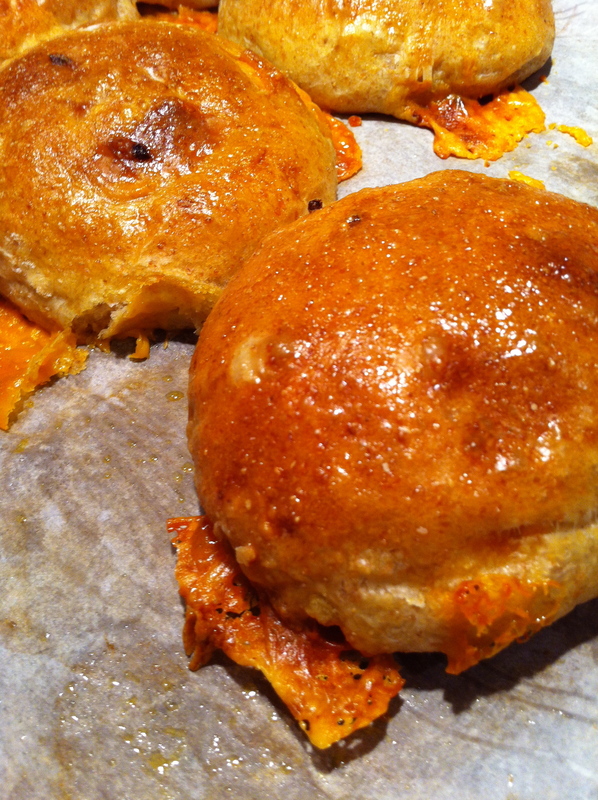 My goal was Maria’s Mythic Cheese Bread: a soft, white marvel riddled with cheesy chunks the size of marbles. The crust was dark amber and rivers of melted cheese ran in streaks down its domed sides. Maria was my grandparents’ cook and every summer she traveled up to Lake of Bays to their sprawling cottage to assume authority over the kitchen. When bread was in the making, she closed the kitchen down like Fort Knox. All windows and doors were clamped shut. But the kitchen’s one swinging door to the dining room was seductively lacking a lock. One day I thought I’d satisfy my eight-year-old curiosity and give it a little push. “Oh no!” squealed Maria, her plump cheeks red and flustered. “The bread’s proofing!” she howled while snapping a tea towel like a whip in my direction. A warm kitchen was Maria’s religious rite. If the bread failed to rise, it was obviously the fault of a no-good child who’d let loose a draft assaulting her dough. She did everything in her power to humidify and intensify the room’s heat, closing all the windows and doors, cranking up the heat in the empty stove and boiling endless kettles of water – all in the middle of summer. 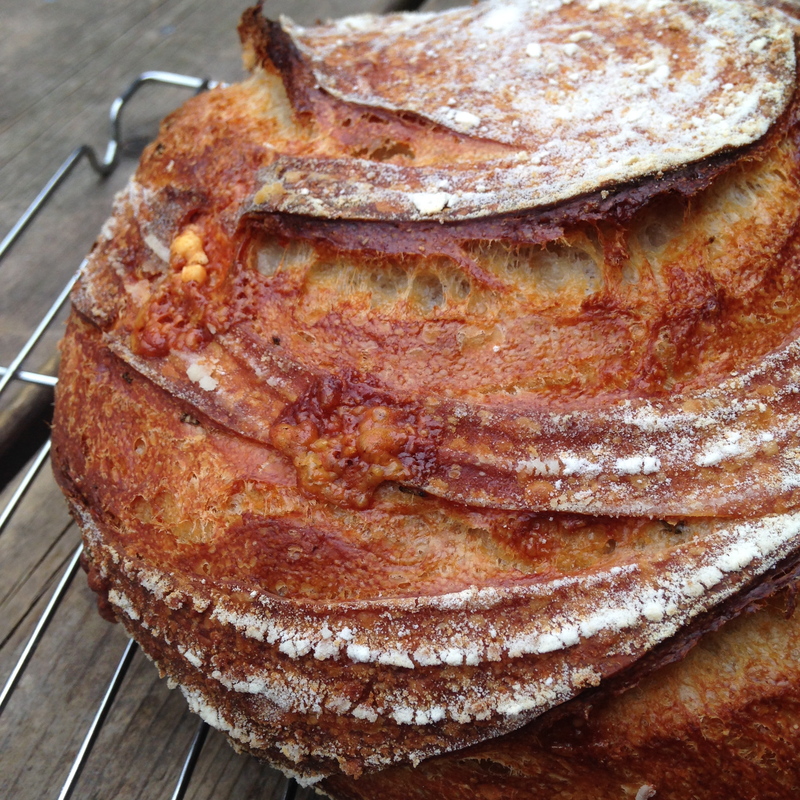 But our taste buds totally respected every iota of her madness, since Maria’s cheddar and chive loaf was pure alchemy. Mine would be too, after a little tinkering. My bible was Great Breads by Martha Rose Shulman. This pivotal cookbook walked me page by page through the rites of bread making, eradicating my Maria-instilled terror of yeast. I learned to use little envelopes of Fleischmann’s yeast, pouring their contents into a small bowl of water with a pinch of sugar, waiting just a minute or two for the yeast to bubble up and tell me it was alive and ready to go. Then I’d measure the flour by spooning it from the bag and filling it above the edge of a dry measure cup, shaving off the excess with the edge of the spoon’s handle. I could have used some help in the kneading department, for a cookbook was a lousy substitute for Maria’s strong hands and knowledge. I knew a little of its rhythm from quick peeks through the cracked door, but Maria always shooed me away. I had to learn it for myself, pushing and pulling what started as a crumbly, floury mass until it morphed into a flexible ball and eventually ballooned around my fingers. Every recipe warned against over-kneading and over-flouring the counter top and only through experience could I sense where that magical line was drawn. There were many of those lines, from the right kind of flour to the right amount of time. I’ve been baking bread for 20 years now and still perplex over the many variables of baking, but the one that made Maria frantic, turns out to be the one I choose to ignore. Bread does not need a warm kitchen to rise, unless you want to make bread fast. Over the years, I’ve chosen to make my loaves slower and slower because they taste better that way. But let’s get back to cheese bread and the magic of Maria’s loaf. Every single bite delivered a mouthful of cheese spiked with garden-fresh chive. My grandmother grew chives as high as hay at the cottage and an addictive, confetti of chives was doused over new potatoes, devilled eggs and chicken salad all summer long. But chives in bread are difficult to calibrate. In fact, all herbs are. Too much, you wreck the bread. Too little, it’s lost and indiscernible. Maria knew exactly how much was right but it still eludes me, so I focus on the cheese, instead. 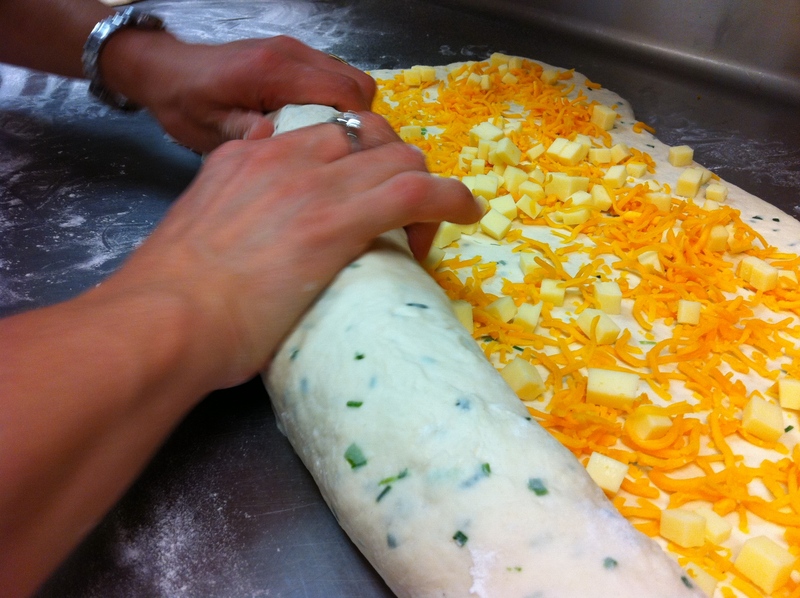 Most bread recipes will tell you to knead grated cheese right into the dough. Once baked, it disappears into the crumb – lunch bag letdown! I like to cube and coarsely grate it. If it’s a straight-yeast dough, I will roll it out into a rectangle, sprinkle it with a cup or two of cubed cheddar then roll it into a loaf. A liberal sprinkling of grated cheese goes on the top of the loaf just before it enters the oven and parchment paper is a must! If your baking pan isn’t lined with this true friend of baking, all that yummy cheese will melt and attach itself to the pan rather than the loaf. Once my kids were growing into full-fledged cheese bread-aholics, Maria and my grandparents were no longer coming to the cottage. Those days were gone, but I dared to fill some mighty shoes and bake bread in the same kitchen, with the windows wide open and the floor scattered with sleeping dogs and crawling toddlers. I’d whip up a sponge starter in the morning in my KitchenAid mixer adding less than a teaspoon of instant yeast to the mixture. After an hour or two at room temperature, the surface would be riddled with holey bubbles, looking like its namesake. I’d toss cupfuls of white and whole wheat flour into the bowl and let the dough hook do what Maria never taught me: knead. Once the dough had proofed once, rising up into twice its size, I’d ask my eight-year-old niece, Jessie to perform one of her favourite tasks – punching down the dough. Then Jessie and I would roll out the dough and nestle it into two parchment-lined pans. There was always a big smile on her little face and mine when we put the loaves into that oven, the same one Maria blessed with her baking 30 years earlier. We knew some magic was about to transpire when we closed the door. And no matter how many times we did this, we always sighed in utter amazement at the beauty and achievement of our cheesy loaves emerging from the oven knowing full well they’d be wolfed down in hours and we’d be doing it all over again, soon. For best results, use organic, hard flours for this bread. Add flour by the ½ cup until it forms a ball. Mix at med-low speed about 6 minutes or until the bread starts to balloon around the dough hook. Transfer to big plastic container or large bowl covered with plastic wrap. First rise 2 hours. Divide dough in half. On a floured counter, roll one piece of dough into a 12 inch x 8 inch rectangle. Evenly scatter one cup of diced cheese on top. Roll up then shape into a loaf and place into a parchment-lined pan. Sprinkle over with half a cup grated cheese. Repeat for second loaf. 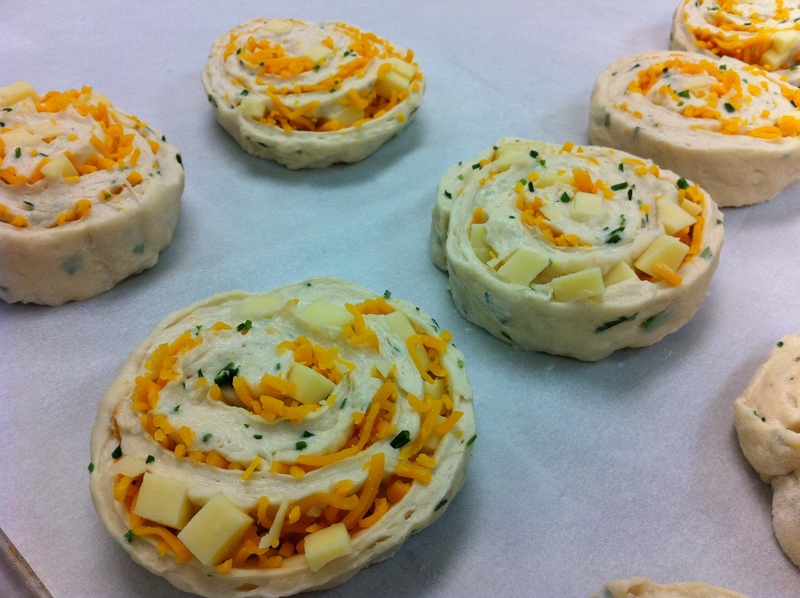 OR make into cheese spiral buns by cutting one-inch thick slices from the cheese roll. Place on parchment-lined baking sheets, sprinkle over with grated cheese. Second rise in loaf pans or as spiral buns: 45-60 minutes (or about ¾ inch over top of loaf pan). Cover lightly with oiled plastic wrap. For loaves, bake 15 minutes, reduce heat to 375°F and bake 40 minutes more or until bottom of loaves sound hollow when tapped. For spiral buns bake at 375 F for 20-30 minutes or until golden brown. This entry was posted in Cheese bread and tagged artisanalbaking, baking, bread, cheddar cheese, cheese, chives, sandwiches, yeast. Bookmark the permalink. So nice to read another Lime Leaves post. Will definitely try this recipe. Cheese, yum! Hope you’ll try the recipe! Sounds and looks amazing Mado…but now I’m wondering why I’ve never tasted your cheese bread?!?! Love the pics. Don would have been very proud! Keep writing – it’s great reading! Thanks, Bella. Twenty-seven years ago TODAY Don walked down the aisle with me. I’ve never seen a man more terrified. I am with Randy? Where have you been hiding the cheese bread? It is gorgeous. I am officially putting in an order if I am on the order list! OMG. This was a great post. I might even pluck up the nerve to try and make this bread. I love cooking but fear bread making. Wendy, do you bake banana bread? If so, you are ready for yeast. You just have to use it once to end the fear-factor! 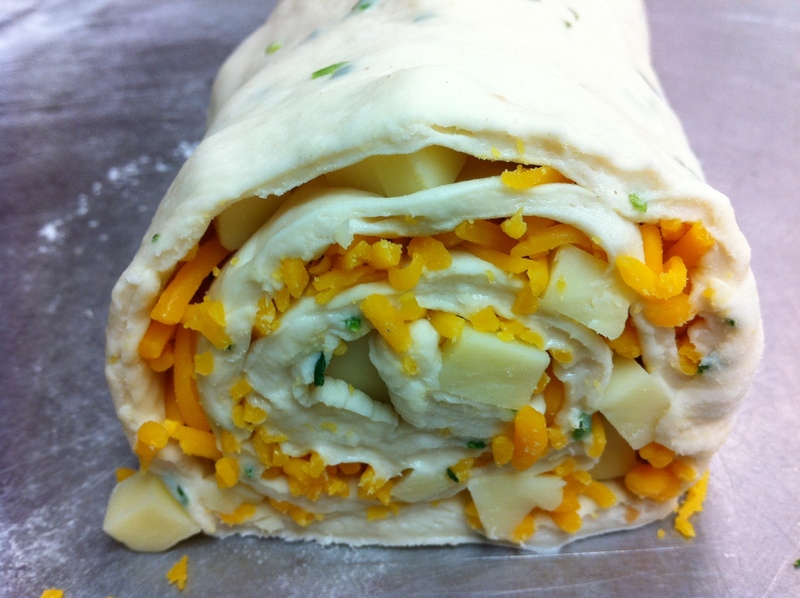 I have just bookmarked this page and must try this cheese bread recipe! It looks incredible. I have book marked this page! This cheese bread looks incredible and I must try it.